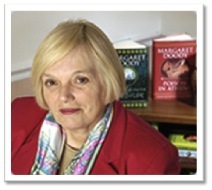 Margaret Doody: One spring evening in Oxford I was reading quickly through Aristotle’s Rhetoric, in preparation for talk with MA student later in the week. When I at last crawled into bed with a detective story, I found myself thinking “Someone should write a detective story with Aristotle as the Sherlock Homes. He is so unillusioned about human nature.” The idea did not go away, and about 3 weeks later I realized that “Someone” was not going to do it—it would be me. I got lots of help and advice from supportive colleagues in Classics at the University College of Swansea, where I then worked. GR We know that your first novel, Detective Aristotle, was actually published at the end of the 70s. Why did the success arrive so late? Did something change in the literary panorama which allowed this? 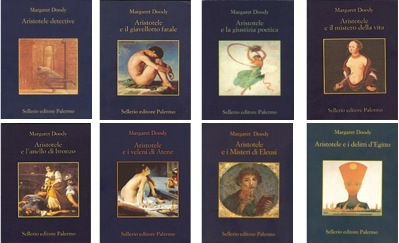 MD I wrote a sequel to the first novel, “Aristotole and Poetic Justice” but I had a normal academic career to manage, so it took me several years. When I looked about me to try to sell it, my first publisher had been bought out, my English editor had gone, and my US editor had retired. The man I had acquired as agent—he offered!—had been kicked upstairs. So the whole support system was gone! Things move faster in business than in academia. GR You are a Professor of Literature and well known for your theory of the birth of the novel in the Golden Age. Therefore, not only an expert in this field but also an in-depth connoisseur. Do you feel that your series of Aristotle gave birth to a new literary genre or, if you had to choose a genre in which to classify them, which would it be? MD The discoveries and speculations in TRUE STORY are deeply indebted to the work I did on the background of POETIC JUSTICE. I thought as part of the “game” of that novel I would include a sample (or parody) of every literary genre known in Aristotole’s time. This led to the question: “Did the novel or anything like it exist in Aristotole’s day?” I then read the ancient novels, and became quite fascinated with them. My answer to the quesiton is enshrined in POETIC JUSTICE—in which the novel is seen to rest on painfully true experience, of persons of various background and ethnicity under the pressure of Alexander the Great, who forcibly brought together a variety of persons of different cultures. GR Many historians of the Golden Age find your texts very precious from the historic-divulging point of view because they are very precise and re-elaborate facts which actually occurred with a surprising language and also a stylistic precision as if you were Greek and had really lived at that time and in that society. The splendid denudation of Frine in Poison in Athens is an example. The reader is really brought back in time and at times has the sensation of being able to think from their point of view. The description of the wedding, of the engagement contract, of the trials, of the social differences; the situation of the female citizens, the buying and selling of slaves, the economic exchanges, the crimes, the religious states, access to culture, the social life of men and women, the clothing, the structure of the houses, the streets, the port; the creation of the plot, Aristotle’s wit and Stefanos’s intelligence -whom the readers very quickly become fond of- are to be considered the “red star” of your novels. The question, however, is have you ever had detractors, among the experts, who have tried to discredit the historical precision of your novels? MD: Surprisingly, classicists have been more than fair—though not the 1st freviewer for TLS. Some are very appreciative (I’ve encountered more resentment from scholars of English literature of the 18th century, who don’t like my depriving the English 18th century of the honor of “inventing” the novel). In the novels I certainly try to be true to known facts and material. I did in the first novel play a trifle cavalierly with the timing of the siege of Tyre—something I wouldn’t have done later. And I have found it impossible not to mention the color “blue” although the ancient Greeks notoriously had no direct color-word for this entity or experience , even though their painting certainly produced this sensory experience . GR According to you, is the Greek way of perceiving life still vital in today’s society and contemporary culture and to what extent? MD I think we all have some simple strong experiences of the world and of living that chime in well with the Greek perception—though I think there are a number of Greek ways of perceiving life. GR Are you planning to visit Italy in the near future and if so, in which cities are you thinking of holding conferences? MD I should love to visit Italy—tell my publisher if you would like a book signing. Si ringrazia Christina Garra per aver curato l’editing di questa intervista. Sarà presto on line la traduzione in italiano.